If you have been using office 365 you would have noticed now it is designed to seamlessly work wtih Microsoft SkyDrive Cloud Storage service. So when you click on Open or Save As you get to see a nice logo for SkyDrive and access the Cloud Storage directly. But when you go to Add a Place you can only find Microsoft Services and not services like Dropbox and Google Drive. You can still browse to your dropbox or google drive by searching your hard drive for it, but why not make it easy. Microsoft isn’t going to include access to competing services right out of the box, but that does not mean you are not able to add it yourself. I tried to use SkyDrive and found that simple issues like a file name being too long created sync errors and crashed the service to the point where I would have to reset the entire data that was in it to correct the situation. After six of my clients continued to have issues with SkyDrive failures I directed the majority of my clients to Dropbox. Some found Google Drive workable as well. So now, how do we get access to a shortcut to those services right in our open / save as window? First off the way to do it is complicated and includes changing info in your registry. So of coarse rather that directing people to try to do that on their own, someone made a script. As always we cannot warrent the quality of a third party script, but it worked for me just great. At the end of the article I will include links to both the Dropbox script and the Google Drive script. Download the file to your computer and run it. It will ask you for the location of the dropbox local path. If you do not know what that is STOP and have a professional help you. Otherwise, go ahead and enter the local path and press enter. The script will then run a number of commands adding the service to the registry settings and now be avaiable to be added to Office 365. 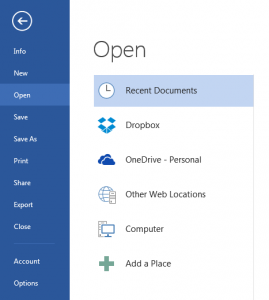 Next you need to actually add the Drobox or Goggle Drive service to your Office 365. First open Word and select the Account Options under file. Select Add a service near the bottom of that window and move the mouse to Storage and select either Dropbox or Google Drive depending on which script you ran. And that is it. The next time you use any Office application, you will see that Cloud service in the list under the Open or Save As dialog box. 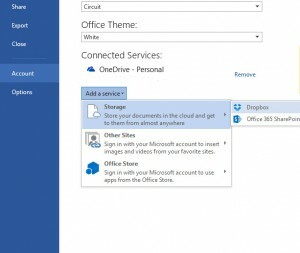 Microsoft did release instructions on how to intergrate any cloud storage service into Office 365 and if you are so technically inclined feel free to read all about it here. Now as promised here are the links to the scripts to install. Again if you are not comfortable in doing this yourself hire a professional. Your Computer Solutions offers to provide remote services at affordable prices to handle your computer issues. You can call the office at 407-826-0810. Now enjoying having your favorite Cloud Services inside of your Office 365. Why Hurricane Shutters? Are you being ‘Forced’ to upgrade to Windows 10?